In 1996, Julious Piti and his wife Taurai Mutembedzi were allotted 14 hectares of very dry land in Chaseyama, which they began to work on by applying permaculture principles, and without any financial support. In 1998, some of his brothers joined him. Together, they created a property which was green all the year through and which produced a lot a food - in an area where almost all of the families are living on farming, but facing massive poverty. Seeing first results of what could be achieved by these means, the local farmers became very interested. Informal training began in the form of "look and learn tours" as people visited the project site daily. Soon they founded a Permaculture Club and the farmers came to work at the project site, thereby learning the techniques and principles underlying the Piti family's success. The permaculture project inspired many farmers and stakeholders to learn non-destructive methods of production, and to participate in the project's decision making processes (community-based planning). Other families and HIV groups came to the project site and collected herbs, vegetables, fruits, planting materials and skills for their own use. In this way, a grassroots organization evolved out of the farmers' initiatives, that continues to actively shape the region. For example, Julious Piti and the farmers are successfully protecting the forest around the springs to help stabilize the area's water supply. In answer to the increasing demand for training, PORET was registered as a Trust by the Zimbabwean Government in 2006. It aims at designing and implementing permacultural training programs as well as establishing more comprehensive training facilities. 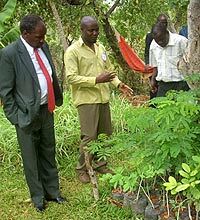 In 2007, the project won the National environmental award, and high ranked Government officials, including the Governor of Manicaland, Tinei Chigudu, were invited to witness the event at our project site. Together with Headman Jinga and the local farmers, PORET Trust applied to and was granted allowance by the Chimanimani District Council to continue expanding the Chaseyama community-based training centre as a demonstration site at a higher level. In August 2009, The Rural District Council offered PORET Trust office facilities to operate from, which we rent at 30 dollars monthly. The room in the District offices complex allows people to see and contact us easily. We intend to install fax and other office equipment that allow the project administration to run smoothly.